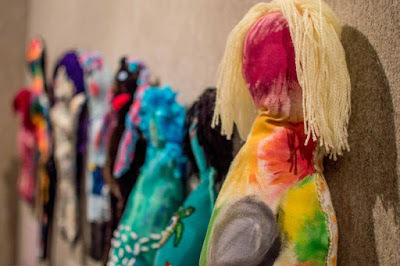 The KZNSA Gallery is hosting the exhibition Re-stitching Culture: Indigenous Dolls of South Africa, Australia and Canada in the Main Gallery, opening on July 31, 2018. Encountering Countenance – Re-Stitching Culture reclaims traditional practice, explores health and well-being, and reveals intimate human stories through doll making. The Re-Stitching Culture collection of dolls collectively shows how the local indigenous communities from each nation, are strengthened through reciprocal, creative and healing processes. This, in turn, supports capacity building for problem solving, and the reclaiming of indigenous knowledge, history and identity. Communal craft and art-making has traditionally been a visually powerful medium for expressing cultural identities. In the pre-colonial past, plant and animal materials were gathered, and crafted in combination with storytelling, singing and dancing. These actions helped to maintain social relations, perpetuate ideals, and support cultural behaviors that were considered beneficial in upholding communal well-being.